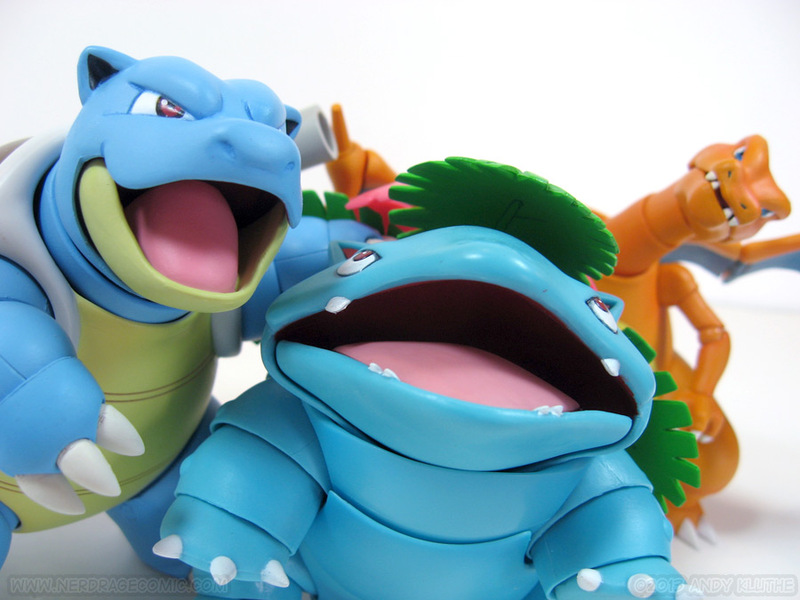 Nintendo has announced that, alongside Pokemon X & Y, they will have a cloud stroage service to...store your Pokemon. For $5 a year you will be able to store 3,000 excess Pokemon as well as transfer old buddies from Black, White, Black 2, and White 2 to the Pokemon Bank to move to your new save. 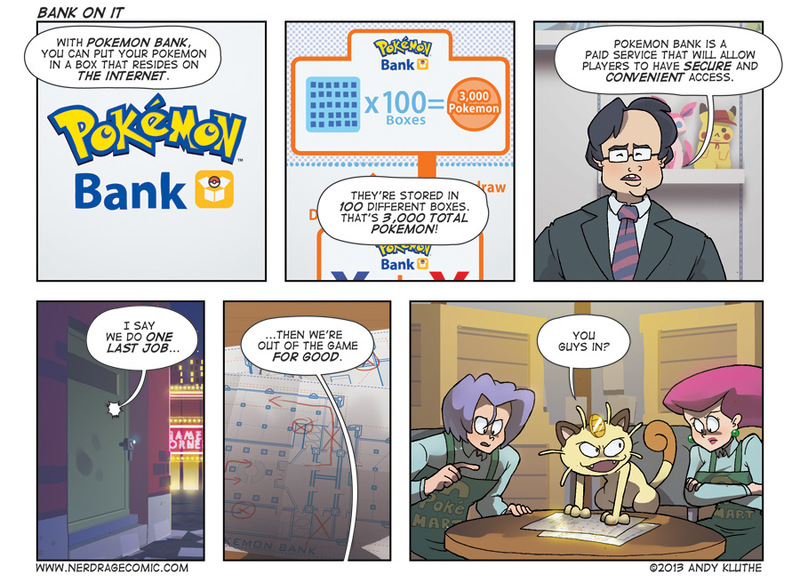 While Iwata swears the service will be easy and secure, you can never be too sure -- I think I know a few criminals who might run a heist on a virtual bank to get free Pokemon. 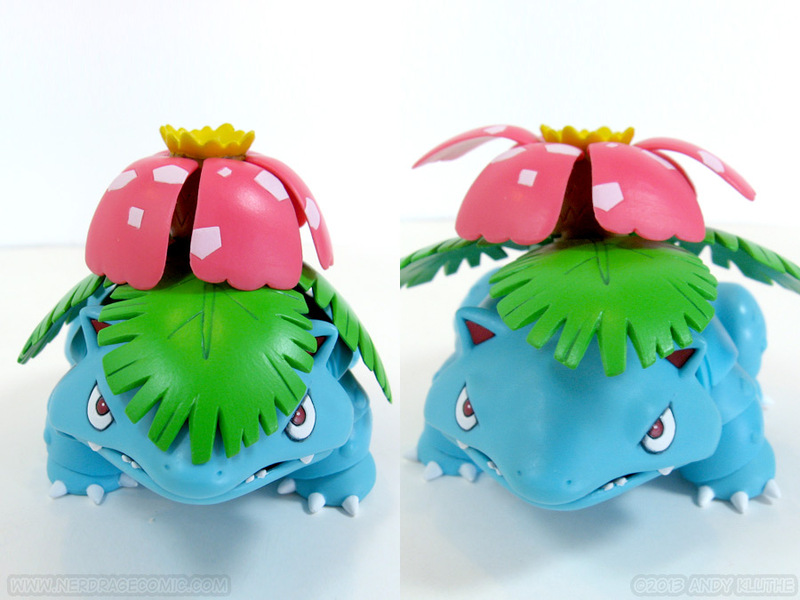 This week we finish looking at Bandai's D-Arts Kanto starter Pokemon -- Venusaur! Click to skip down to the review! At last, the trio is complete. 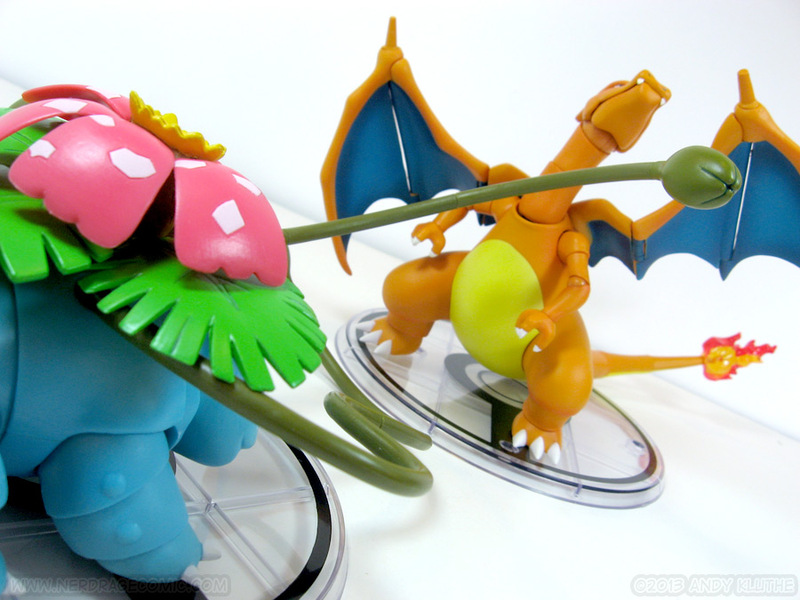 For reference, here’s the review for D-Arts Charizard and D-Arts Blastoise. 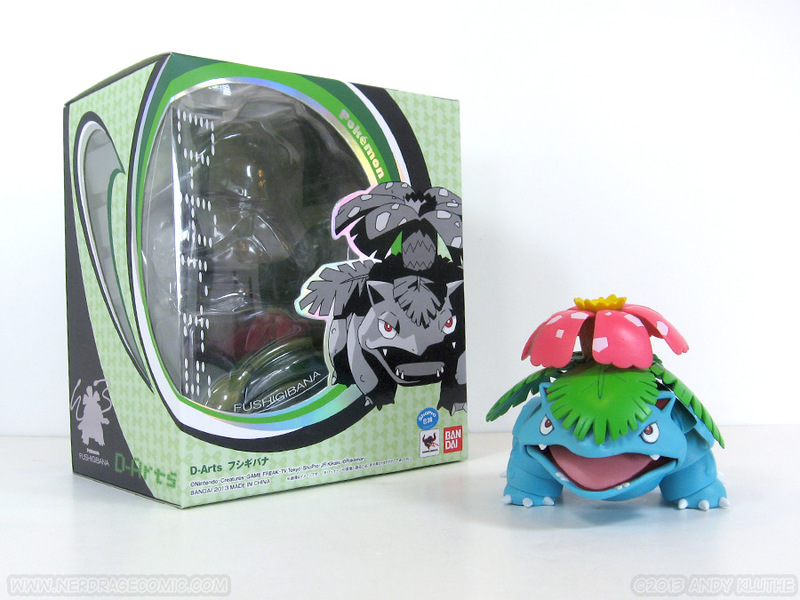 Venusaur actually has the smallest box of the three. 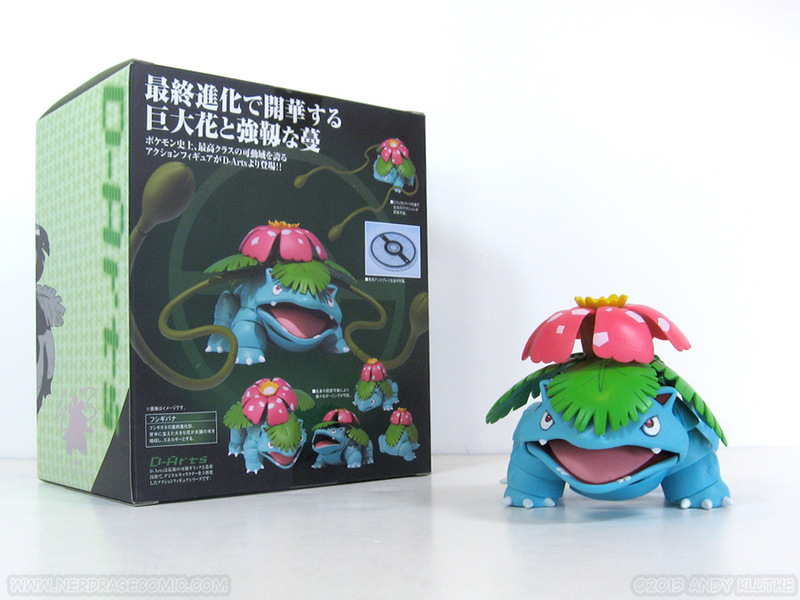 Venusaur’s also the smallest figure, so it shouldn’t exactly be surprising. 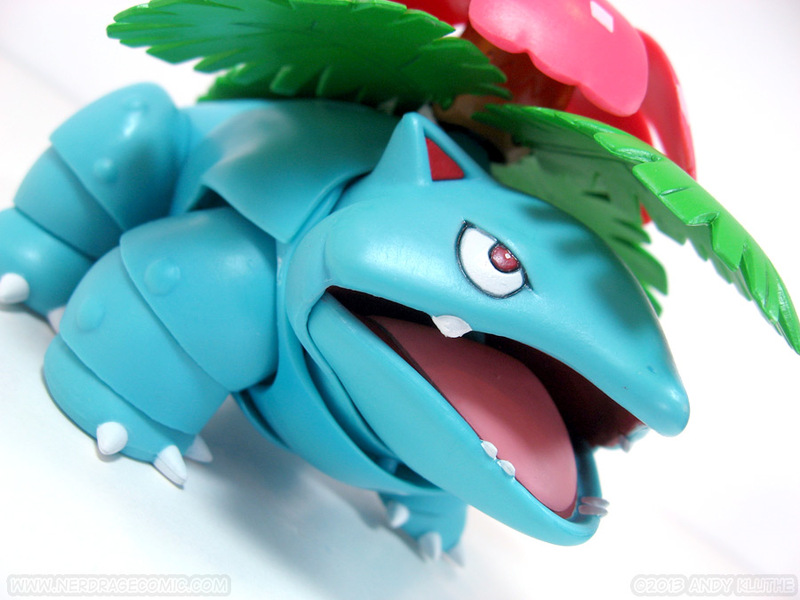 Venusaur is actually more articulated than the other two. Charizard had a lot of joints, but barely utilized them. 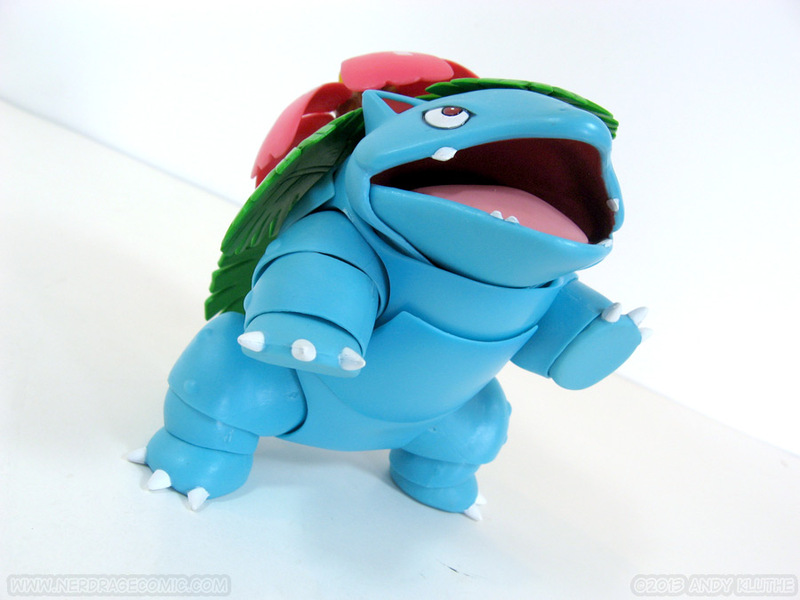 Blastoise had, uh, statue-esque good looks and we’ll leave it at that. The leaves and petals on his flower are all individually ball jointed. In fact, the instruction sheet recommends removing the two side leaves when inserting the vine whip parts. The stalk itself is also ball jointed at the base. 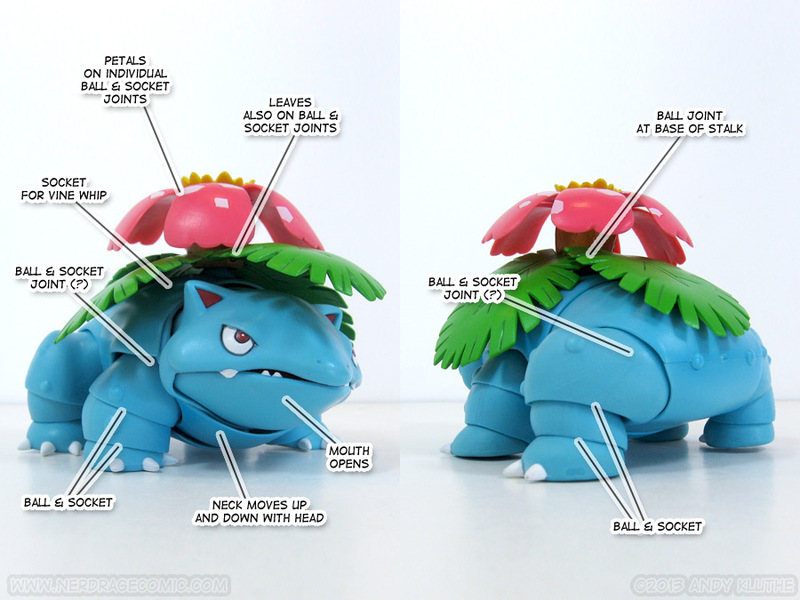 Because of the design, a lot of joints are covered so it’s hard for me to identify specifics for this review. For example, I think the middle segment of each leg is ball jointed on either end, with a floating plastic cover over it. 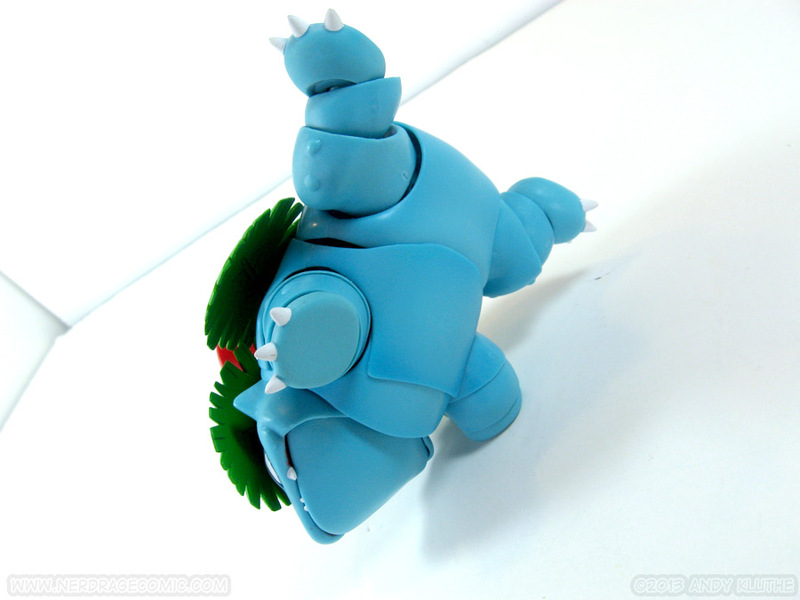 His body is partially hollow and made up of a series of plates that give him some ‘neck’ and let him look upward without exposing a gap. Overall, there seems to be more visibly noticable joints than the other two, but that’s the price you pay for more articulation. 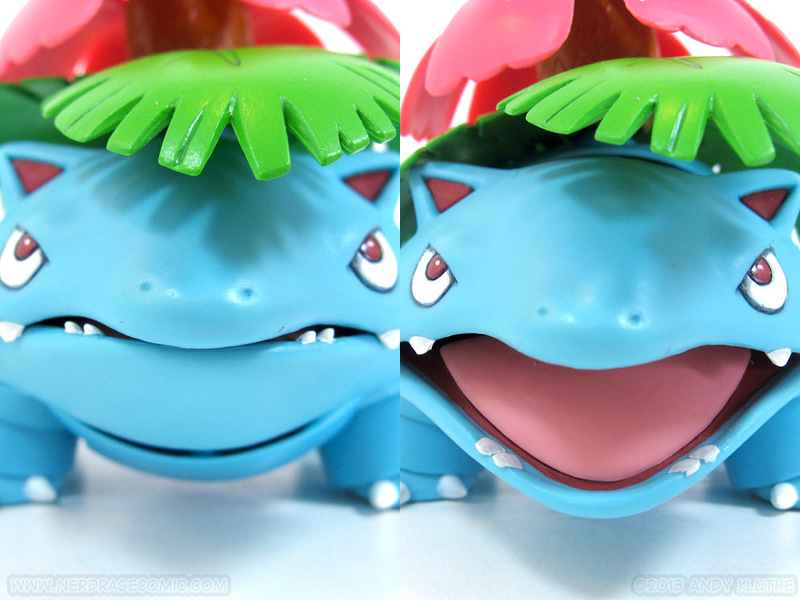 Thankfully these visible seams are a little more disguised by Venusaur’s squat, lumpy body (also he’s pretty sensitive so don’t call him squat and lumpy). 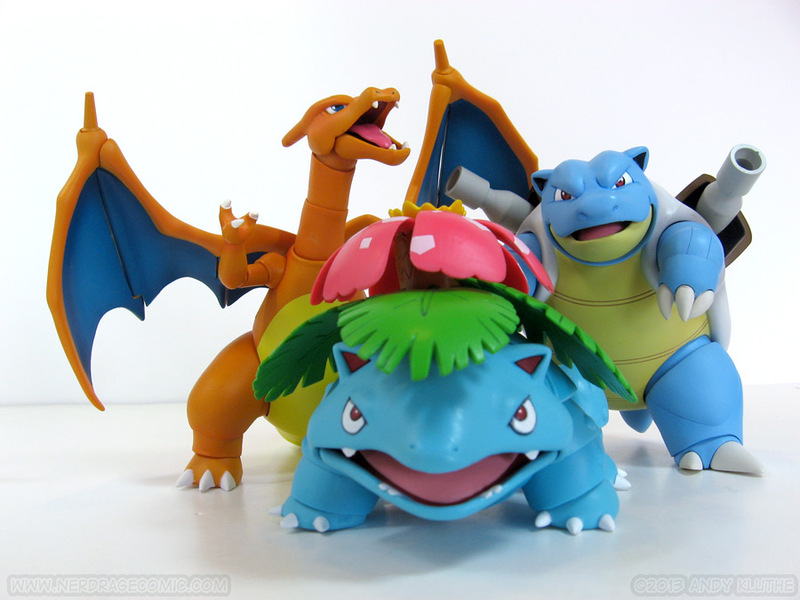 The previous three Pokemon figures were heavily painted with airbrushed shading and a matte finish. 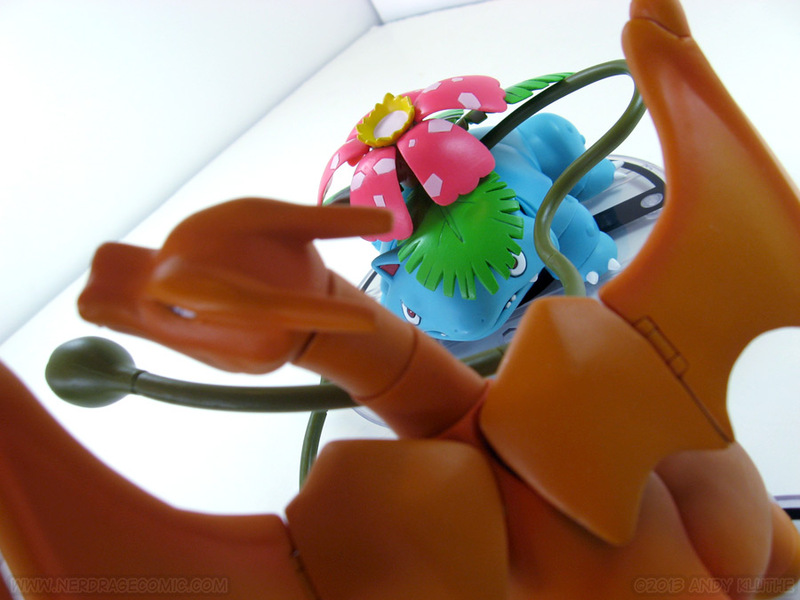 While it looks really nice in specific places, I also worried about the future durability of the paint; for example, Charizard’s was already wearing down on the neck. 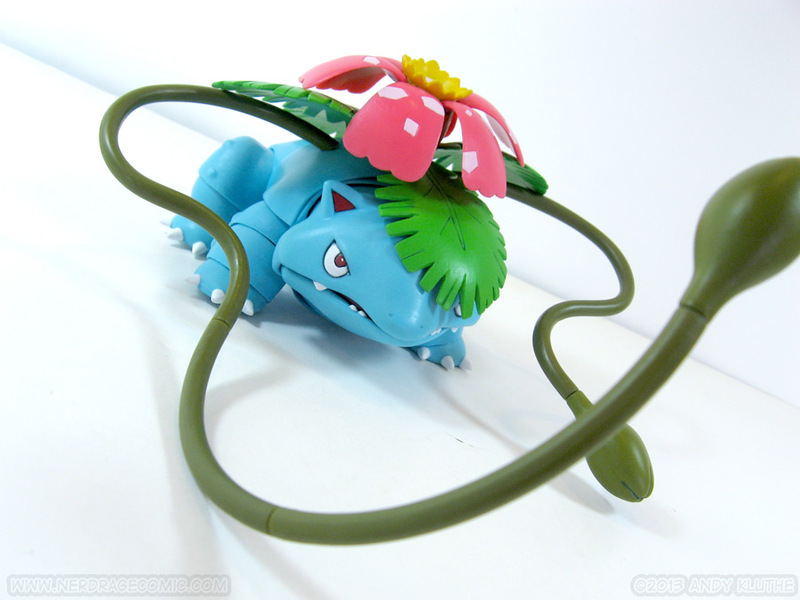 Venusaur seems to be a little more bare. Actually a lot more; a lot of him feels like it may just be uncovered plastic…and I’m okay with that. With all the overlapping and rubbing parts, I’d hate to be worried about his leaves scraping off back-paint or his legs wearing against the body. The eyes, teeth, toes, and the inside of the ears and mouth are all appropriately painted. The leaves have a dark green wash over their lines (and the ends of the vine whips, which we’ll get to shortly). The pink petals have the white spots painted on. Overall he looks really nice. 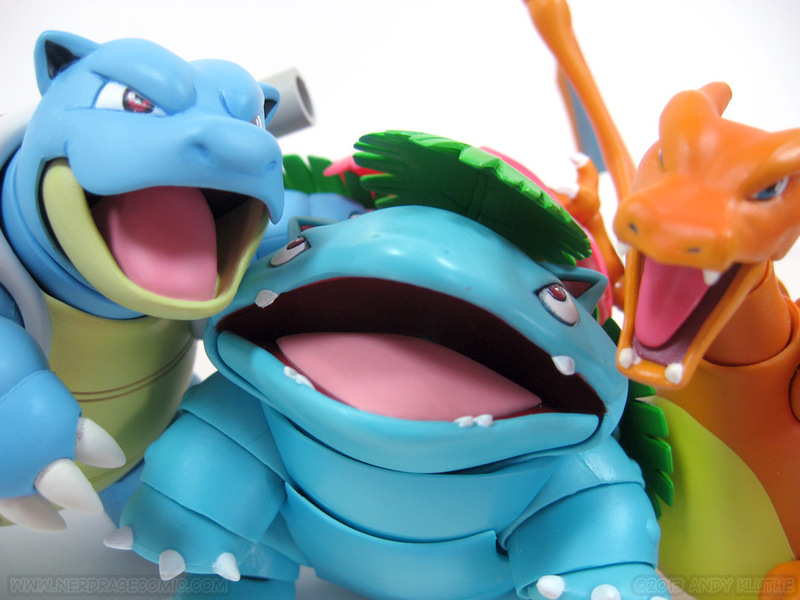 If his finish is indeed plastic, it doesn’t stand out next to the other two starters. Speaking of standing by the other two starters, depending on your scale system, you might be disappointed in his size. Pokemon is always ambiguous with listed pokedex heights. Really, Voltorb is half a meter tall? Then how do they get mistaken for pokeballs? Arbok is 11 feet tall? Oh, that’s, uh, length…right? And then the show (and comics) just kinda scale them all however they want, regardless of what the Pokedex says. 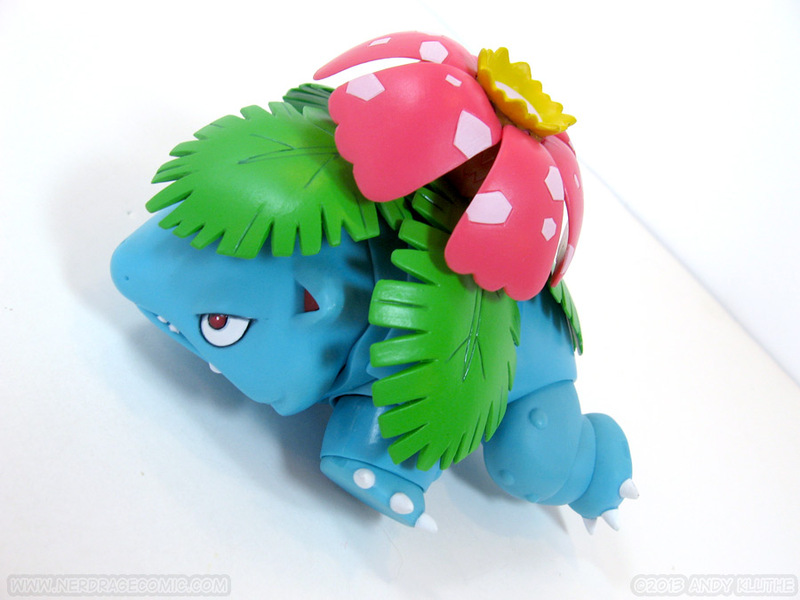 So Venusaur may look a little shrimpy, if you were expecting him to be huge. He’s definitely not as big as he appeared in the show. 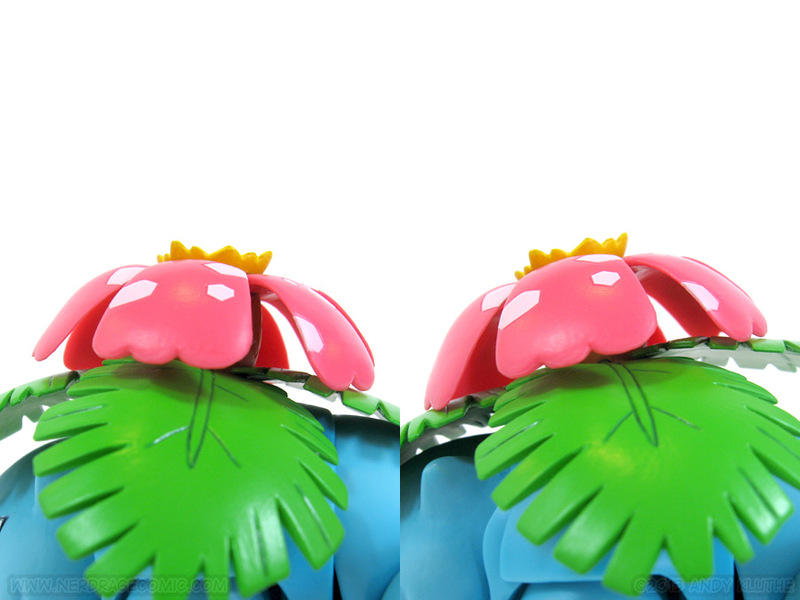 And because I have nowhere else to mention this: the leaves are all individual sculpts. Each has a small number molded on the underside of the stem. If you’re looking down on the back, starting with the head, they attach counterclockwise 1, 2, 3, and 4. 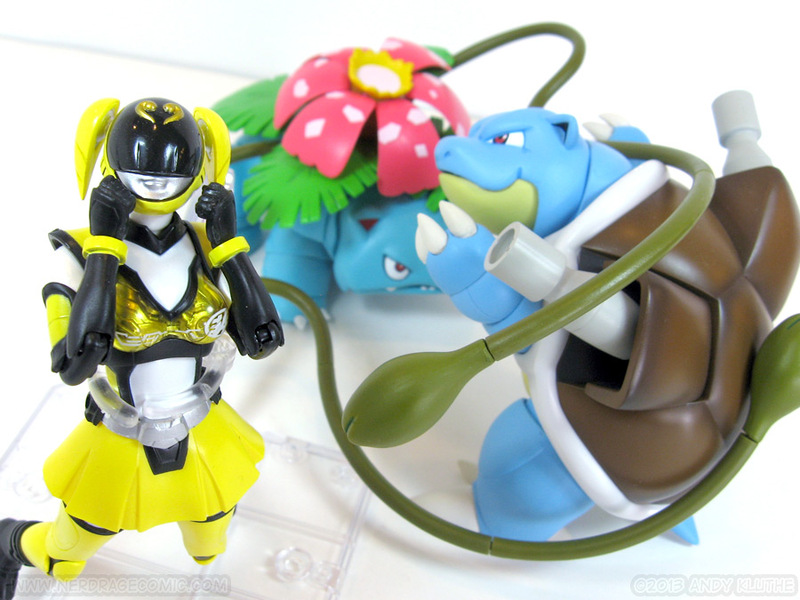 Bandai heard I gave Blastoise the Most Pointless Stand of The Year Award and decided to step it up. 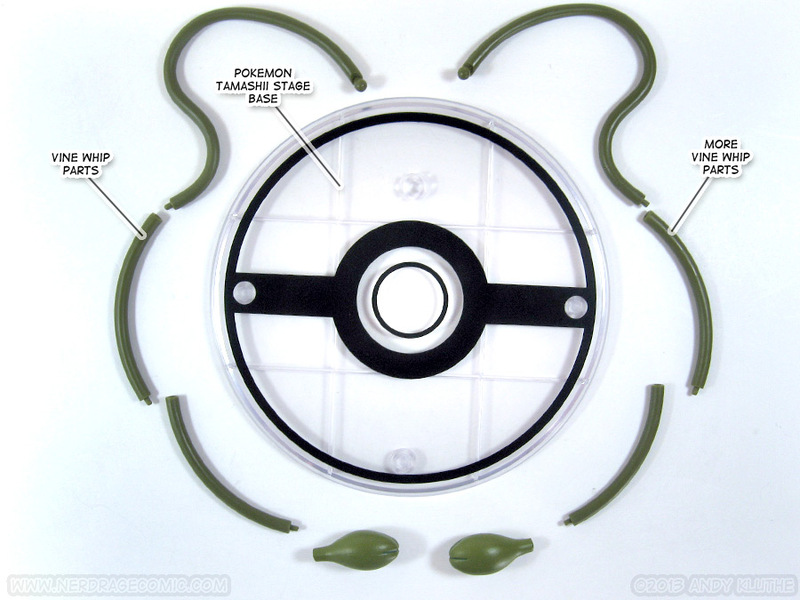 You get no arm with this Pokemon Tamashii Stage stand, and no claw, but you do still get the base. Which barely makes it a stand. 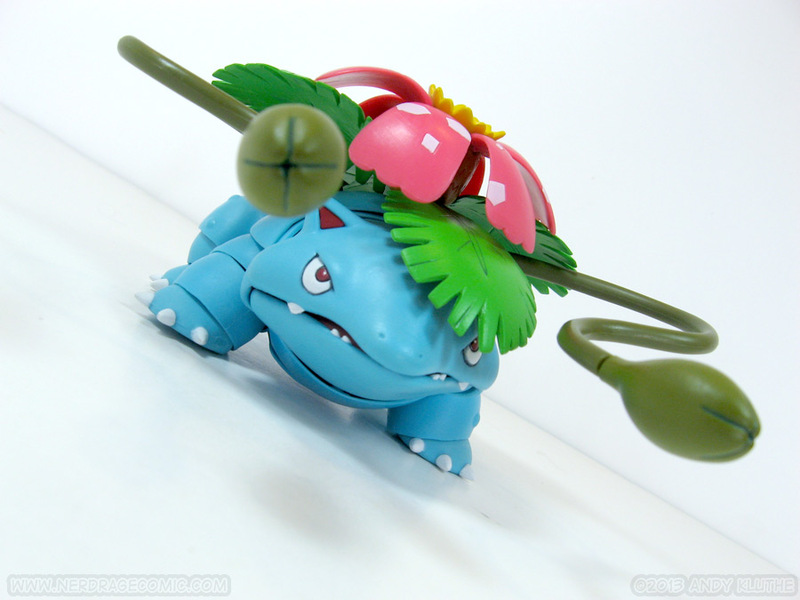 It’s literally just a base plate Venusaur can stand on, which I suppose he only got because everyone else had one. 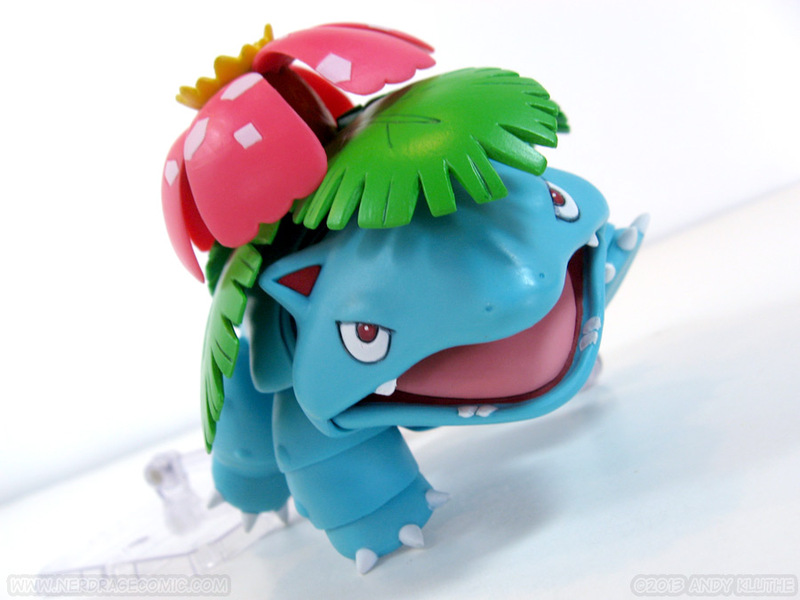 Congratulations, Venusaur, your “stand” is a consolation prize because you have no real way of using a stand. 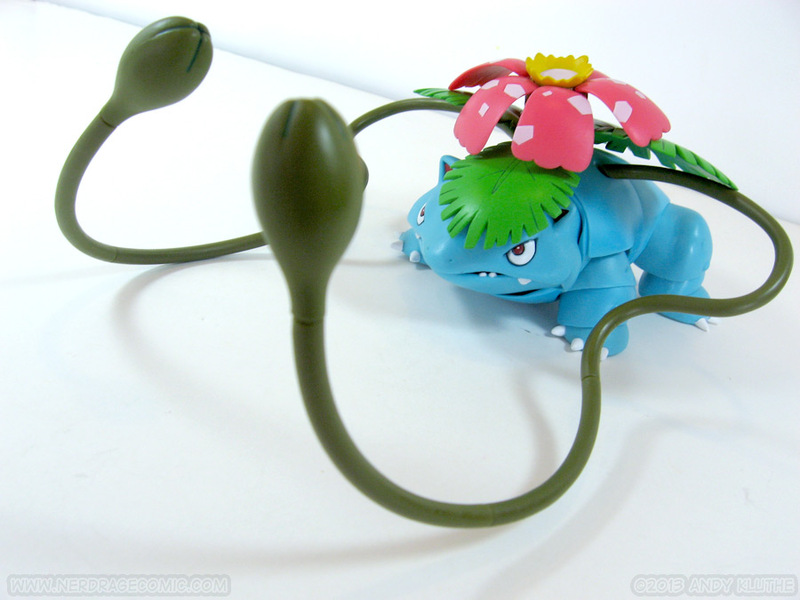 Besides that, Venusaur comes with 8 segments to make 2 vinewhips. Sorry, anyone who was hoping for solar beam. As mentioned earlier, you’ll probably have to pull off the two side leaves to pop in the ball joints. I’m really glad they didn’t use wire for this effect because that tends to kink over time and eventually break (or at least refuses to make a smooth shape.) You can mix and match the segments to make vines of various lengths. Because they are just solid plastic anchored by a ball joint, only the shorter ones will stay up in the air; if you plug a lot of pieces together, they start sagging under their own weight and may even pop apart. By turning the individual parts you can make the vines appear to be a number of different shapes. I’m particularly fond of the shortest configuration when he’s just sitting on my shelf. 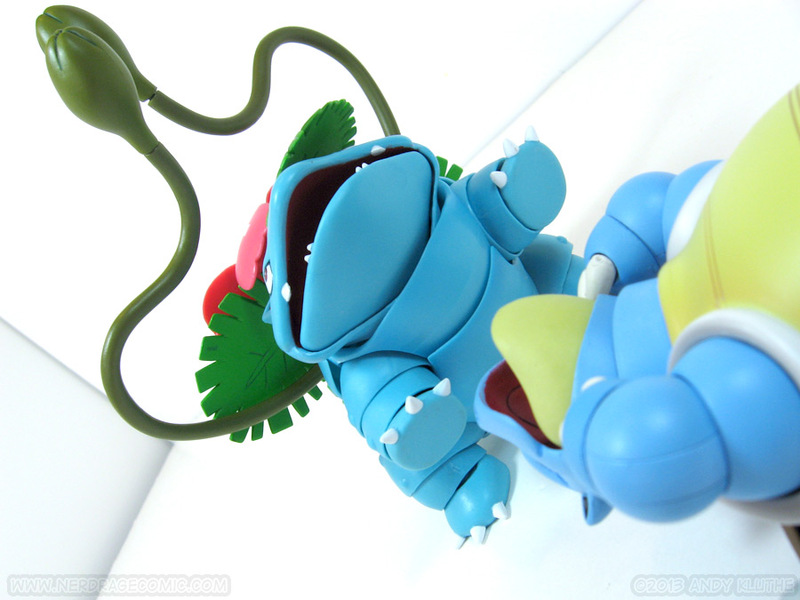 • He’s a nice, big Venusaur figure. • …More so than the other two! • Paint application look good without scraping and falling off. 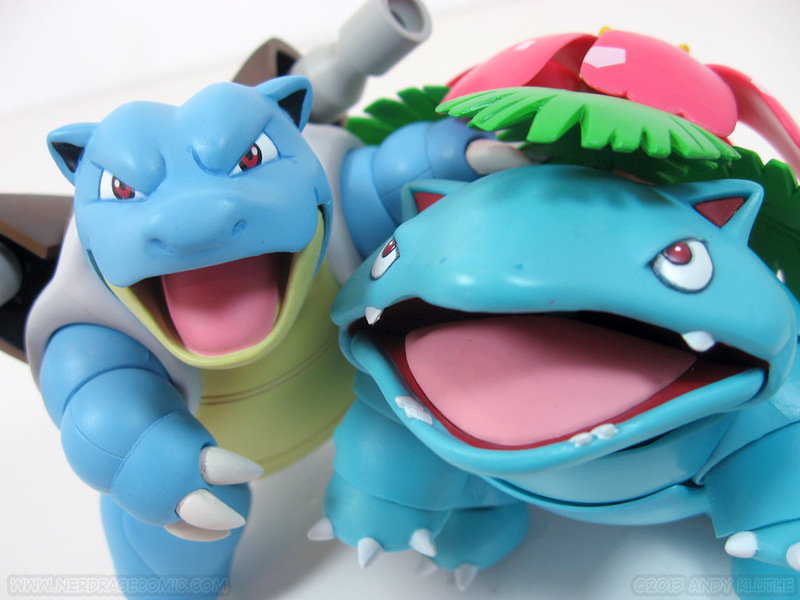 • Looks awesome posed with Charizard and Blastoise. • Simpler paintjob means less fancy airbrush shading, etc. • Depending on your scale-expectations, he may be small. • Articulation is less disguised with more visible joints and seams. 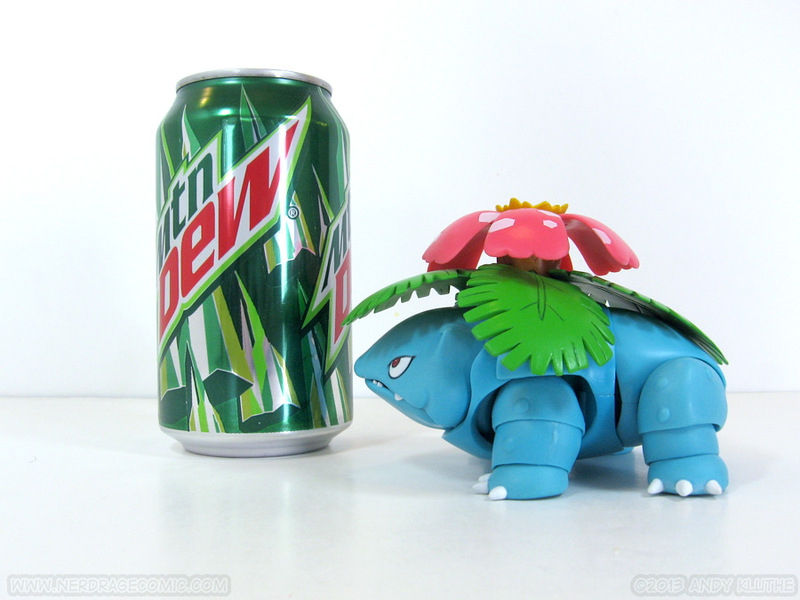 Since Bulbasaur was always my choice at the start of the game, I’m probably a little biased – but this is my favorite of the D-Arts Pokemon. 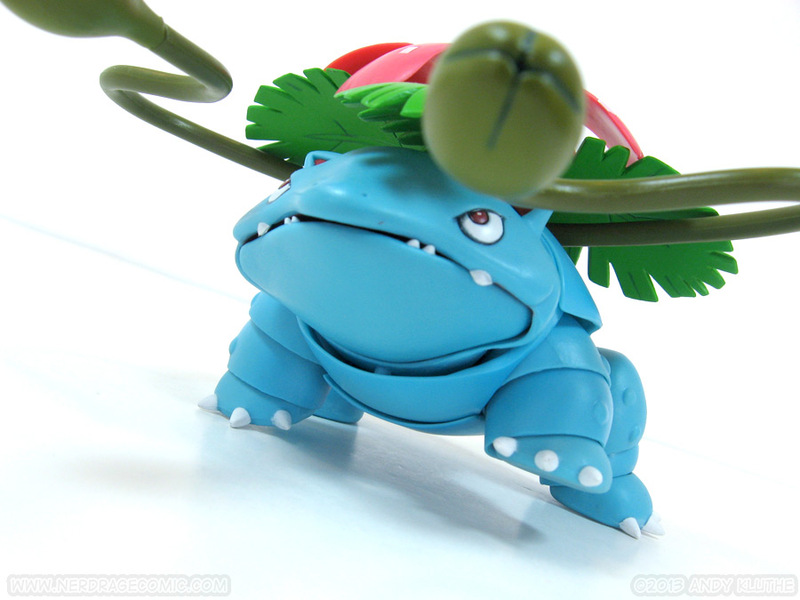 Or maybe my articulation standards were just set particularly low after Blastoise – Venusaur certainly surpassed that. I would argue he’s actually the most poseable of the three. Plus, I don’t feel like he’s going to scuff his paint job every time I move him. And the vine whip effects parts are cool. Overall, a real winner. 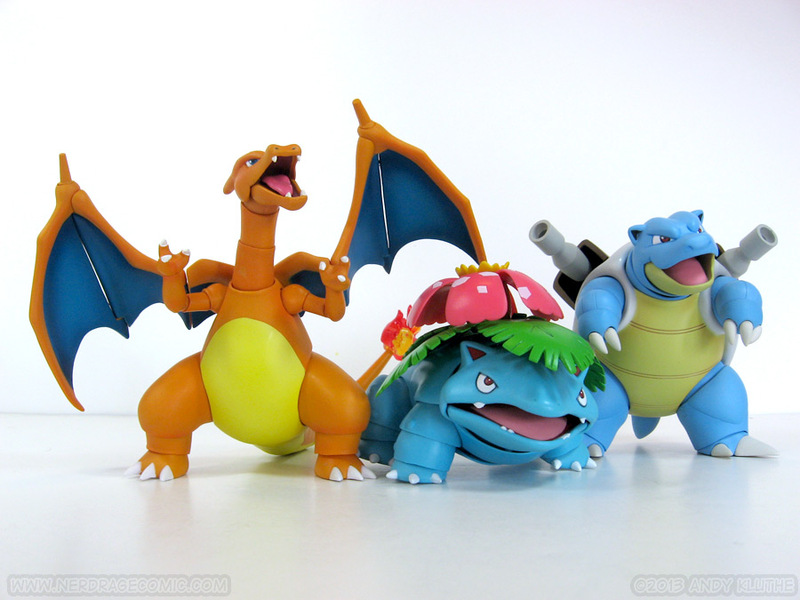 Oh, and did I mention he looks really great standing with the other two starter Pokemon? C’mon, you know you can’t just have two of ‘em. My order was from Amiami, who offered outstanding service and great prices (as usual). If you’re out to catch ‘em all, you can still place an order over on their site!